Last Thursday, the Center for the Study of Gender and Sexuality hosted a conversation with artist and activist Syrus Marcus Ware and diversity advocate Precious Brady Davis, moderated by scholar and writer Jenn Jackson. The discussion revolved around Ware’s and Davis’s efforts and experiences in activism, particularly within the Black Lives Matter movement and LGBTQ+ advocacy, as well as their view of art’s role in driving social change. Jackson, a Ph.D. candidate in the political science department focusing her research on intergroup and intragroup political differences within the black community, initiated the exchange by referring to the ubiquity of the #BlackLivesMatter hashtag on social media, especially during the protests following the 2012 murder of Trayvon Martin. Ware, a founding member of Black Lives Matter in Toronto, expressed his belief in the occurrence of a modern-day black cultural renaissance much akin to the historical Harlem Renaissance. The Afrofuturist artist described his collaboration with Blackness Yes!, a Canadian black and queer community-based committee, in producing Blockorama, a series of multimedia performances on one of the biggest stages at Toronto Pride. Having worked for over 15 years in leadership development and youth empowerment, Davis also sees current movements for social justice as revivals of history. “We [have] always taken that which oppresses us to liberate us,” she stated, evoking the Black Panther Party and the role art played in propagating their message, including Emory Douglas’s galvanizing images of “bad policemen,” as an example. Her own activism involves a lot of public speaking; she’s given talks at universities around the country. Cosponsored by the Center for the Study of Race, Politics, and Culture, the conversation was preceded by a three-hour live drawing performance by Ware as part of his Activist Portrait Series. These 12x5 foot larger-than-life portraits of activists are meant to reverse the art-historical convention of reserving large-scale portraiture for white, male authority figures; instead of immortalizing popes or kings, Ware has chosen to celebrate those he believes are putting their lives on the line to better their communities. In a similar vein, another one of Ware’s projects pays tribute to underappreciated activists; in Activist Love Letters, Ware invited participants to write letters of thanks to their local activists and went on to mail them. Most of Ware’s art is inextricably linked with his activism, and although it has won him praise, that wasn’t always the case. As an art history and visual studies student at the University of Toronto, his art was often criticized for being too political. 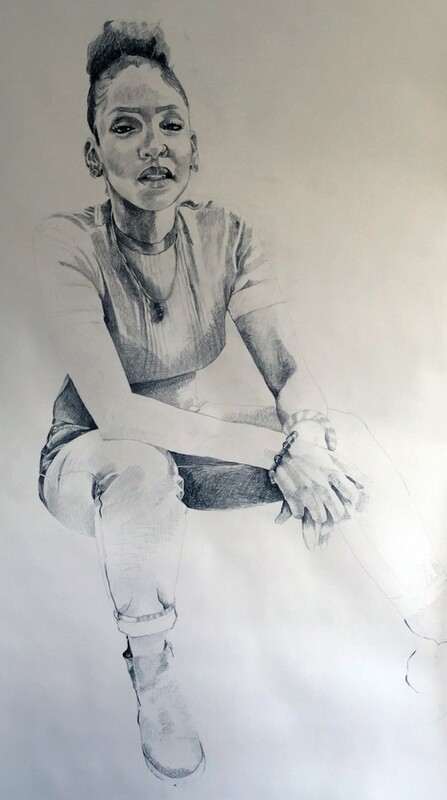 In addition to being taught a predominantly white curriculum, Ware recalled being taught that black women did not start making art until the 1970s; he described these experiences as “invisibilizing.” This casts a new light over his gargantuan portraits: they’re informed by a need to recognize, record, and reify a section of society that will likely otherwise be neglected—or “invisibilized”—by a patriarchal white society. The panelists’ work demonstrated that there are many ways in which one can be an activist: Syrus Ware leads a three-week activism and arts training camp for children; Jenn Jackson performs research that allows for meaningful dialogue about the best ways to tackle such ingrained injustice; and Precious Davis works within bureaucratic structures to make them more inclusive.